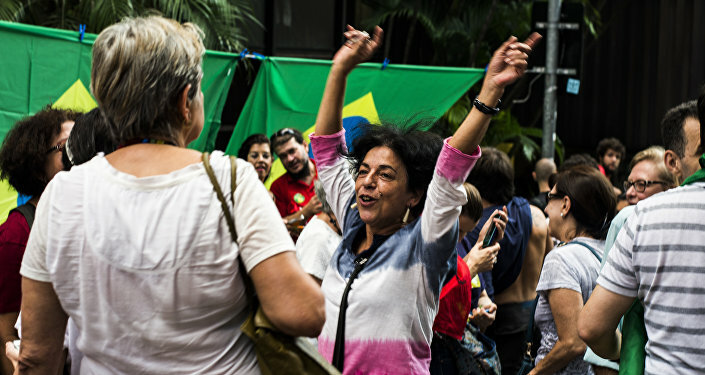 As a metaphor of the advanced state of putrefaction plaguing the entire political system of one of the Global South’s leading nations, nothing comes close to what is about to take place in Brazil. The notoriously corrupt leader of the lower House in the Brazilian Parliament, Eduardo Cunha — holder of 11 illegal Swiss accounts, listed in the Panama Papers, and indicted at the Supreme Court — has scheduled a crucial plenary vote on the possibility of impeachment of President Dilma Rousseff for this coming Sunday. Sunday traditionally is the day when an overwhelming majority of Brazilians relax watching football on TV. The crook in question also tried to defined the rules of the game; the roll call would start with the wealthier southern states, which are more favorable towards impeachment — a euphemism for coup/regime change, the culmination of the soft Hybrid War strategy deployed from the beginning by the usual suspects allied with the Brazilian oligarchy/comprador elites. This voting procedure — now changed; voting will alternate northern and southern states — was supposed to create a wave in the House floor towards impeachment, thus allowing the glorious entrance of another crook; current vice-President Michel Temer. Anyway, the magnificent piece of double down crooking should ideally yield Temer as President and Cunha as Vice-President. The run-up towards Sunday's farce has been monopolized by a vicious infowar — with mainstream media, controlled by four families, purporting to create an impeachment inevitability. And yet all bets are off. Rousseff's opposition, increasingly desperate, has not regimented all the necessary two-thirds of patsies/fools/crooks/traitors for the vote in the House. The matter must then be referred to the Senate. And the Supreme Court must also rule on whether Rousseff committed a "crime of responsibility." She's actually being accused of accounting tricks that allegedly misrepresented the government's fiscal status — something that every Brazilian president has done, not to mention leaders all across the world. In parallel, vast strands of civil society are now mobilizing to make sure the coup will be defeated in Congress and in the streets. This sorry saga has nothing to do with corruption, allegedly the key motive behind the sprawling, two-year-old, initially NSA spying-fueled Car Wash investigation. It's all about dirty political opportunism. Vice-President Temer's conspirator colors were fully revealed via an audio leak expertly delivered to the Globo empire's widely watched 8 o'clock nightly news. The PR angle was to create a "positive climate" towards impeachment, with Temer already acting presidential and positioned as the prodigal bearer — and facilitator — of good news, finally moving the nation away from the current, dire economic crisis. Temer then went on a mainstream media overdrive, stating that, yes, he's qualified for the Presidency; but if the impeachment motion is defeated, he must remain as Vice-President. He insists this is not a coup, while abhorring the possibility of a new general election, because that would represent a "constitutional rupture". Macbeth? No; just a lowly parochial opportunist. So where's Lula in all this mess? Glenn Greenwald has conducted an extensive interview with the former President and Global South political icon where he defends the government's case. Compare it with the City of London view, for which, of course, this is not a coup. What matters is the wellbeing of "foreign investors" — as if the Brazilian government had an obligation first and foremost towards them. Well, it's doable — if foreign investors have comprador elites and mainstream media working for their interests. As it stands, the nation remains deeply polarized — even with Rousseff not charged with any wrongdoing, unlike the lot in Congress who wants to bring down her government. Of the 65 members of the sham congressional committee who voted on impeachment, 35 of the 38 who voted in favor are being investigated for corruption. The bulk of civil society, led by social movements and academia/intellectual circles, has moved forcefully against the coup. With a crucial nuance; they are behind Lula personally, not the Workers' Party, which is indeed tainted by corruption. 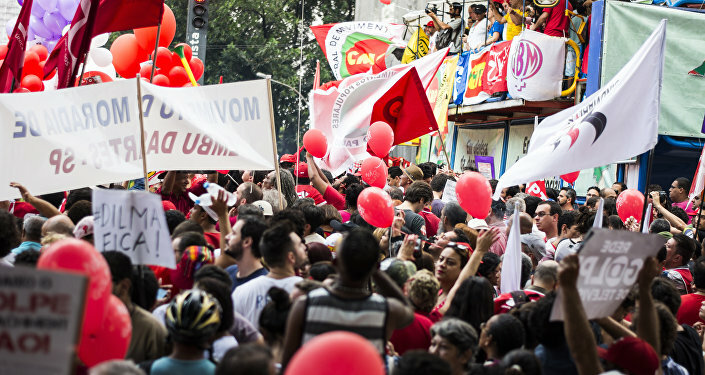 The big industrial/banking interests concentrated in Sao Paulo — Brazil's wealthiest state and the nation's economic superpower — supported by most mainstream media and the Koch Brothers-financed "youth movements", have now moved towards the center, with a "No Dilma and no Temer" motto, and already focusing on the 2018 elections. The Right still believes in Car Wash to decimate the Left. Yet what already happened in the constantly evolving chessboard was the decimation of the former social democrats turned neoliberal enforcers, the PSDB. These Wall Street/City of London cronies now can only count on a last-minute Car Wash-related scandal, the attorney general coming out with a bombshell, and the influence of CEOs of major Sao Paulo-based companies. Their patron saint is former Brazilian President Cardoso — former social developmentalist and "Prince of Sociologists" turned mere comprador elite paperboy; he managed to alienate both the social democrats and strident right-wingers. And yes, this is all about the 2018 elections — because the impeachment, in a nutshell, means the judicial/media reversal, via a white coup, of the 2014 result, when Rousseff was reelected President. And yet all recent simulations reveal that Lula still stands a chance in 2018 — although his percentage of popular rejection remains high. As much as he emerges as The Great Conciliator — and he's the only one who can pull it off, after impeachment is defeated — these numbers will be reversed. Rousseff's government, in the last few days, has managed to organize a somewhat minimalist base capable of preventing impeachment, yet incapable of assuring governance. At least the Supreme Court now seems to be finally inclined to examine the — dubious — juridical merits of the Congress-driven impeachment process. What's certain is that the Globo media empire, in the last stretch, will go no holds barred to twist the vote towards impeachment — including a twisted, spurious last-minute Car Wash bombshell; that's how the judicial/media complex works. The official spin is that Car Wash is the Brazilian remix of the Italian 1990s Mani Pulite investigation. Well, judge Gherardo Colombo, who was part of Mani Pulite, visited Brazil and explained what happened next; the investigation died down because the average Italian citizen was fed up with the righteous Savonarola mood of accusing just about anybody of corruption — scandal after scandal after scandal. This sheds new light on Car Wash's lethally mistaken move of trying to incriminate Lula by all means necessary — without serious evidence. And that was the last straw that laid bare to the so far silent majority, the "deep Brazil", the stark fact of a highly politicized "fight against corruption". The ball is now with the Brazilian attorney general. Either he positions himself as a lowly partisan, or with a necessarily impartial Brazilian Public Ministry. This might entail "saving" Rousseff but at the same time trying to tarnish Lula's political capital for good. As for the Supreme Court, it's now more than obvious that they should authorize legal action against notorious crook Cunha — leading to his inevitable removal as president of the lower House. A serious total package would imply the whole impeachment farce being judged unconstitutional, period. Even the OAS secretary-general, Luis Almagro, has dubbed it a surrealist farce, "the world upside down" of the notoriously corrupt chasing away an honest President who always favored the fight against corruption. The "secret" of the whole parliamentary conspiracy — to which Western corporate media is oblivious — is that those crooks voting for impeachment on Sunday need by all means to escape the clutches of Car Wash themselves. Amidst this gaggle of Hollow Men, it's hard to find a peaceful way out. If Rousseff is not impeached she will be unable to govern; if impeachment wins it will be tarnished as illegitimate. Assuming the impeachment motion is approved in the House, the Senate could have up to May 11 to finally deliver its verdict. Rousseff would then be automatically suspended for up to 180 days, during which time the President will be "judged"; all bets will be off; and Hybrid War will keep paralyzing with a cobra clutch a key BRICS member. Mission accomplished?